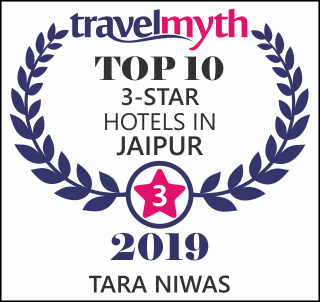 Welcome to Tara Niwas, a family managed luxury house hotel in Jaipur, India with great location that is close to old city, railway and central bus stations yet quite and green. A charming guesthouse in Banipark area of Jaipur, it has 24 rooms, nice garden, home like food and peaceful environment at a great value of money. We also offer attractive prices for long stay at Jaipur (15 days and monthly packages). Our friendly staff aims to give you a home like environment that is comfortable, safe and easy on pocket. With service like free wi-fi, travel assistance, same day laundry etc and delightful features like bonsai collection, rabbits on the lawn & fish ponds; Tara Niwas is a great place to stay for people on holiday or on work! For latest reviews please click here.